The fact that it has been the most used P2P application of the last few years, has had as a consequence that eMule has been used as a base application for many customized versions. Among these applications we'll be able to find eMule pHoeniX. - Download files from the eD2k (eDonkey 2000) and Kad (Kademlia) networks. - Conversations with other users by means of the internal instant messaging program. - Access to chat channels by means of the IRC protocol. - File sharing system that can differentiate between friends and unknown users. - File search engine that can tell the difference between videos, audio, compressed files and general documents. 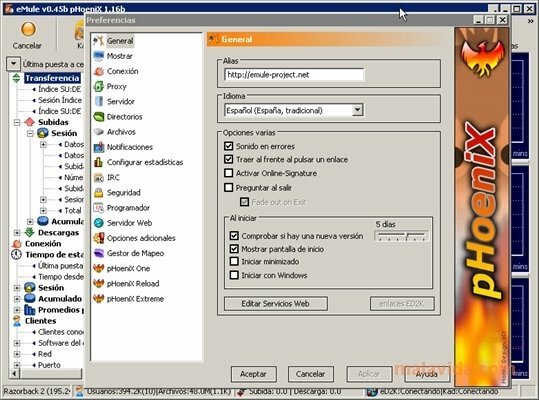 Therefore, if you want an alternative to eMule that offers you all the services with an interface that is much nicer and more usable, download and install eMule pHoeniX.